Samsung Smart Switch Not Working? What is the Alternative? Purchasing a brand-new Samsung smartphone can be pretty exciting, considering you have the chance to use the latest features introduced by the new technology. However, most people are concerned on how to transfer the files from old device to the new device. This is important because our phones contain important information of our daily lives that we couldn'’t afford to lose. And that's where Samsung Smart Switch comes into play. It is an ideal solution to transfer data to Samsung device but recently people are complaining on the forum about its performance. Samsung Smart Switch is comparatively heavy in size that consumes too much CPU resources. Moreover, many people have also complained that files are often found corrupted after being transferred to the new device. That's why, we are going to list down the best Samsung Smart Switch alternatives that could help you to replace the tool with more upgraded functions. 1. Samsung smartphone or old device can't be recognized. 3. Not connecting to iPhone. 4. Not enough space error. 5. Take long time to respond. 6. Connection lost during transfer. 7. Stuck on connecting to iOS devices. Samsung Kies is a program made by Samsung to help their customers moving files from one Samsung device to another. This tool is trusted as it is created by Samsung itself and could be a great alternative to Samsung Smart Switch. 1. Easily transfer files from one phone to another via Wi-Fi or data cable. 2. Move any kind of multimedia files from Samsung to personal computer. 3. Perform a full backup or restore for your device. 1. No option to connect two Samsung phones directly. Data can be only copied via computer. 2. New Samsung smartphone not supported. 3. Out of date user interface. Androidphonesoft Phone to Phone Transfer is probably the most user-friendly and powerful data transferring app available on the internet. Transferring data from one device to another couldn't be much easier. The best part is that it allows you to transfer data from one phone to another without even copying any file to PC. It literally takes one single click to magically move all files from old device to the new one. Basically, you will have to install the program, run it and connect both phones to PC using data cables. 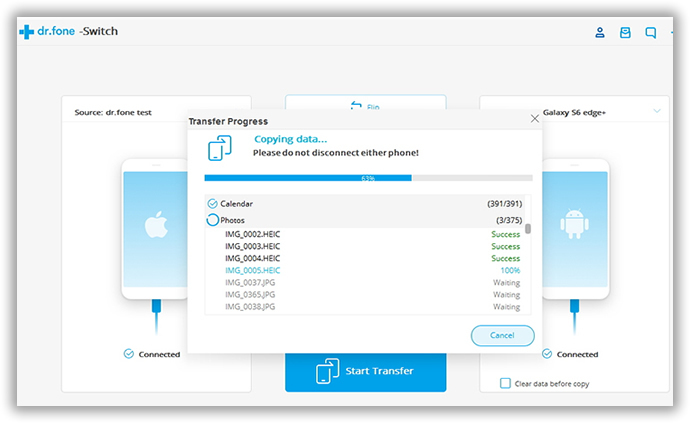 Then, select phone to phone transfer option on the main screen and click on "Start Transfer" to copy all files from one device to another. That is pretty simple, right? A complete tutorial can be found in here. 1. Transfer data between two devices, including Android, iOS, Blackberry, Windows Mobile. 2. Over 25+ data formats are supported like SMS, contacts, notes, apps, WhatsApp, call history, etc. 3. Completely backup the entire device and restore from backup at any time. 4.Impressive and simple user interface. 5. Perfectly work on both Mac and Windows. 1. The trial version is free of cost but in order to enjoy all features, you need to register the program. 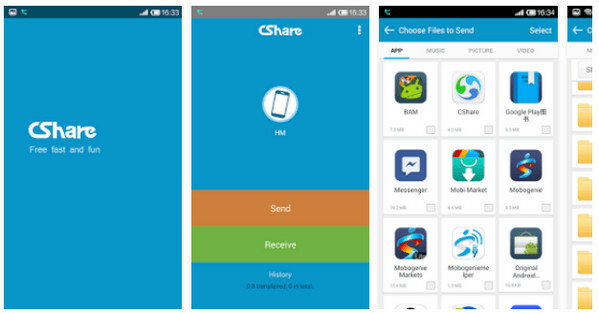 CShare is another tool to transfer files from one phone to another but it’s not a desktop tool but rather an Android app that helps to accomplish this task by connecting two phones over the same Wi-Fi Network. No computer is required to run this app and it can be used to transfer all types of multimedia files. 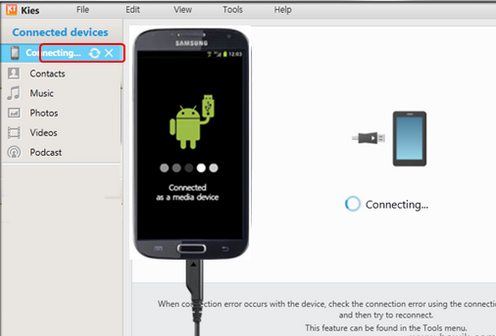 Presently, only Android users can operate this program and it typically is a good replacement for Samsung smart switch. All you need to do is install the app in both phones and simply tap on send from the old phone. Then repeat the same process and tap on receive on the new device. Choose all the files that you want to copy and hit the “Transfer” button to get the task completed. 2. Supports all Android devices. 1. Can't be used to transfer contacts, documents, messages, etc. 2. Onlyt Android device is supported. So, if you are not a fan of Samsung Smart Switch then in this tutorial, we have reviewed 3 other tools that can be a good replacement. However, if you are a simple and sober person then Androidphonesoft would be the best choice since it can get all the transferring tasks done with a simple click. Moreover, it has a responsive support staff who are eager to help you with any question.